Artist: Jean Pillement. The Ladies Amusement; or, Whole Art of Japanning Made Easy, first edition published by Robert Sayer, London, 1759, This image is from a facsimile of the second edition of 1762, published in 1966, page 54. 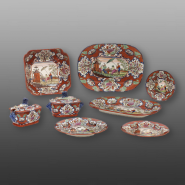 A partial dinner service in The Apothecary pattern. A pierced earthenware dessert dish with a molded basket weave outer border. It is printed in black underglaze with overglaze enameling. The molded sections of the outer border are highlighted with blue, turquoise and red. This pattern is recorded in the Transferware Collectors Club Pattern and Source Print Database as The Apothecary. The central pattern is surrounded by a wide inner border of four large reserves containing floral and botanical patterns and by four small reserves each with a different bird image.